The event took place 100 years ago. The Pioneer did further research on Cromwell and compiled all the information into this article. Smith Center was founded in 1871 by L. T. Reese with the aim of making it the county seat. The county had been named after Major J. Nelson Smith. It became the county seat in 1872. The	Smith County Journal at that time in history. In the pages of the newspaper the fair board began promoting the Smith County Fair. On Thursday, Aug. 31, 1911, Page 1 - The Commerce Club will give a tour of the county to promote the fair. Page 3 - During the fair The Reas will be at the Opera house each night. "The Reas are about the most popular troupe that visits Smith Center." Page 5 - Extra Fair attractions include a fast ball game on Tuesday. On the second day are motorcycle races. The purse for first and second to come in under the wire is $20. On the third day of the fair the rural route carriers of this county will have their motorcycle race. The purse is to be same as the day before, $20. On the fourth day there will be a free-for-all race of the cyclists. Five to enter, three to start with a purse of $50 for the event. Page 1 - The north sidewalk at the west end of New York Street is rapidly being completed. The grading at the end of the street is being completed soon which will be a convenience to patrons of the fair. Before only Court Street ran to the fair ground. striplap, grooved roofing, fencing and boards was advertised by Smith Center Lumber. Also on Page 2 is the information of the Commercial Club tour. W. H. Nelson was the general manager of the trip. Henry Williams was the assistant. The tour was getting to be 100 miles. Day one would be the west side of Smith County and day two the east side. The areas on the tour were Reasmsville, Athol, Gaylord, Cedar, Claudell, Kirwin, Agra and Kensington. This tour was to create interest in the fair that starts Tuesday. Schyler Stevens was promoting a drinking fountain with good cistern water, electric fans that maybe would be turned on if it was hot, restrooms and chairs to rest for awhile. On page three, the speed ring program is better filled than ever before with horse races. New York Street is for auatomobiles racing, Court Street is for teams and other rigs. On page four and five it was announced that A.J. Watson and wife will be serving meals to the public at their residence near the fairgrounds gate during the fair. Everything guaranteed to be clean and rates reasonable. Also printed was, "here is one-contribution by a local poet who offers it as a full rather than a spring production; 'The Fly Man will be the Highman at the Fair.'" 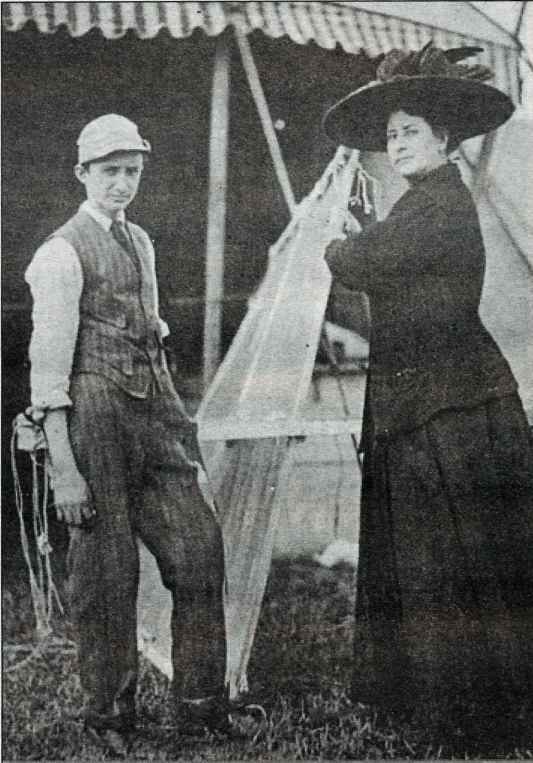 On page five: Balloon ascencion is promoted on the first and second day of the fair and will be at the Lebanon 24th annual "Out for a Good Time", Page six was an ad for the aeroplane. 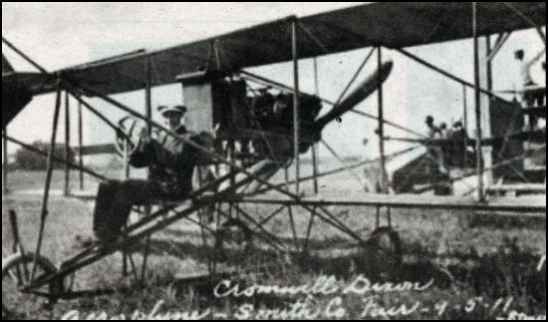 In the next week's ussue of the Smith County Journal, it was announced that the scheduled pilot, dies at a performance in Norton and Cromwell Dixon was now the performing pilot. And in the New York Times it was printed: "NORTON Kan., Sept. 1. --- J. J. Frisbie was killed today by a fall in a Curtiss biplane at the Norton County Fair. He met with an accident yesterday, and went into the air again today only when driven to it by the taunts and jeers of the crowd. The engine of his machine fell upon him, crushing his left side and chest. He lived for about an hour. and is searching for 2. It states "Cromwell Dixon, Aeroplane - Smith Co. Fair 9-5-11"